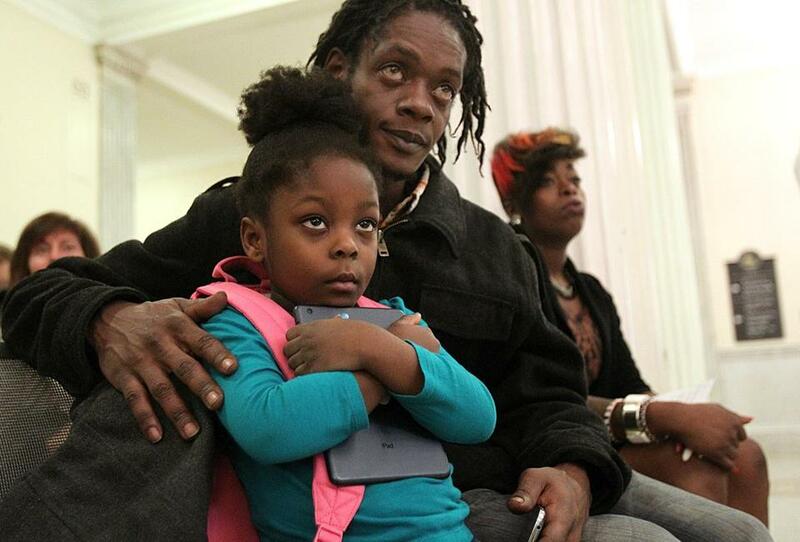 Preshiox-G’Ani Waite, 4, was at the State House Monday with her parents, Garrett Waite and Naromi Occeus. The family lived in a shelter for 27 months. Saying that Massachusetts is facing “the biggest homeless crisis we’ve ever seen,” advocates are pushing for a $30 million boost to a state program that helps very-low income people pay for permanent housing. The advocacy group Homes for Families is asking state lawmakers for $87.5 million for the Massachusetts Rental Voucher Program, a 52 percent increase over the program’s current budget of $57.5 million. There are about 7,000 vouchers that have been given to people in need, Hayes said. An additional $30 million in funding would provide about another 3,000 vouchers, she said. Households that receive vouchers pay up to 40 percent of their income toward rent; the voucher covers the rest, Hayes said. The administration of Governor Deval Patrick, which proposes no increases in its fiscal 2015 budget plan, says it has helped boost funding for the voucher program in recent years, adding money for 2,500 additional vouchers since 2012. But advocates say the increases have failed to keep pace with need. “We have more families than ever that are finding themselves homeless for a variety of reasons, be it foreclosure, a lack of affordable housing, job loss, working in jobs that don’t pay enough for rent,” Hayes said. She said that in the 1990s, the rental voucher program had $120 million in funding. At that time, there were fewer than 900 families in emergency shelters and hotels, she said. Currently, about 4,200 families are in emergency shelters and hotels statewide, according to state figures. The state has set aside $110 million to pay for emergency shelter and is projected to spend more than $40 million on temporary housing in motels, Hayes said. Another source of housing subsidies for families has been frozen since March under federal budget cuts known as sequestration, she said. One woman looking for a permanent home is Ciara Prescott, 22, who said she lives in a shelter in East Boston with her young daughter. She listed one of her former residences as a motel located along a highway. The push for more funding for rental vouchers has a sympathetic ear from the Senate’s chief budget writer, Senator Stephen M. Brewer. Brewer, who is chairman of the Senate Committee on Ways and Means, attended a State House event Monday promoting more funding for the voucher program, where he was honored for his work to end homelessness. In an interview, Brewer said the program deserves the increased funding, but he stopped short of making guarantees. “Any time that we can keep kids from being in motels is a meritorious endeavor,” Brewer said. He added that about 25 percent of a $196 million supplemental budget under consideration pays for emergency shelter and assistance. Colleen McGonagle, chief of staff for Representative Brian S. Dempsey, a Democrat from Haverhill and the top budget writer for the House, said the request for increased funding is under consideration. The voucher program “is a critical tool in reducing homelessness and providing safe, affordable, permanent housing in Massachusetts,” said Honan, chairman of the Housing Committee in the House. “We need permanent affordable housing in Massachusetts, and the [voucher program] is an important part of that,” he said. Naromie Occeus, 27, a mother from Dorchester, said that she moved out of a shelter 10 days ago into an apartment. Occeus, who has a 4-year-old daughter, said she cried when she learned she would be getting her own place.